This article is about the professional wrestler. For the musician, see Tyler Bates. Tyler Bate (born 7 March 1997) is an English professional wrestler currently signed to WWE, where he appears on their NXT UK brand. He is a former WWE United Kingdom Champion and NXT Tag Team Champion. His win of the United Kingdom Championship at age 19 made him the youngest singles champion in WWE history, and its youngest inaugural champion. He and Trent Seven form the tag team "Moustache Mountain" and have collectively held the RPW Undisputed British Tag Team Championship in Revolution Pro Wrestling, the Progress Tag Team Championship in Progress Wrestling, the Chikara Campeonatos de Parejas in Chikara, and the NXT Tag Team Championship. Bate, Seven, and Pete Dunne collectively form "British Strong Style". Bate debuted in Preston City Wrestling as "The Iron Master" Tyler Bate at PCW Fright Night III on 31 October 2014, competing unsuccessfully in a 4-way match also featuring Charlie Garrett, Rich Swann and Zack Gibson. Bate returned to PCW at Shooting Star in January 2015, aligning himself with The Hunter Brothers and Ryan Smile. Bate and his team were then defeated by Pete Dunne, Damian Dunne, Morgan Webster and Mark Andrews. In early 2015, Bate, alongside Trent Seven, debuted in American promotion Chikara as part of their tour of the United Kingdom, defeating The Hunter Brothers in a dark match on 3 April and losing to the Devastation Corporation (Max Smashmaster and Blaster McMassive) in another dark match on 6 April. In their final dark match on the tour, Seven and Bate teamed with Clint Margera to take on Pete Dunne, Damian Dunne and Jimmy Havoc in a losing effort. Bate teamed with Seven and Dan Moloney at that year's King of Trios as Team Fight Club: Pro, making it to the semi-finals before being eliminated by the Bullet Club (AJ Styles, Matt Jackson and Nick Jackson). In 2016, Seven and Bate began competing more regularly in Chikara, and on 21 August, they defeated Los Ice Creams (Hijo Del Ice Cream and Ice Cream Jr.), N_R_G (Hype Rockwell and Race Jaxon) and The Devastation Corporation to win the Chikara Campeonatos de Parejas. They were stripped of the title during Chikara's secret season 16. Bate returned to Chikara on 1 September 2017, when he, Trent Seven and Pete Dunne, billed collectively as "House Strong Style", entered the 2017 King of Trios, defeating House Whitewolf (A-Kid, Adam Chase and Zayas) in their first round match. Over the next two days, House Strong Style defeated House Throwbacks (Dasher Hatfield, Mark Angelosetti and Simon Grimm) in the quarterfinals, House Rot (Frightmare, Hallowicked and Kobald) via forfeit in the semifinals and House Sendai Girls (Cassandra Miyagi, Dash Chisako and Meiko Satomura) in the finals to win the 2017 King of Trios. Bate debuted in Progress Wrestling at Chapter 28 alongside Trent Seven as Moustache Mountain in a loss to Damian and Pete Dunne. At Chapter 33, Moustache Mountain split after Seven turned heel, attacking Bate and aligning with Pete Dunne to form British Strong Style. At Chapter 39, Bate returned to Progress, attacking Jimmy Havoc during a seven-man elimination match for the vacant Progress World Championship, turning heel and aligning himself with Seven and Dunne. On 16 December, Seven and Dunne were stripped of the Progress Tag Team Championship after Dunne attempted to give his half of the shield to Bate. Two weeks later at Chapter 41, Seven and Bate defeated The London Riots and The LDRS of the New School (Zack Sabre Jr. and Marty Scurll) in a three-way tag team match to win the vacant title. Bate made it to the finals of the Super Strong Style 16 Tournament, defeating Pastor William Eaver, Mark Haskins, Matt Riddle, before losing to Travis Banks in the final. At Chapter 50, Bate and Seven lost the Tag Team Championships to #CCK (Chris Brookes and Kid Lykos). After regaining the title, Bate and Seven lost it again to #CCK in a ladder match on 10 September 2017. On 15 December 2016, it was revealed that Bate would be one of 16 men competing in a two night tournament to crown the first ever WWE United Kingdom Champion on 14 and 15 January 2017. Bate defeated Tucker in the first round to advance to the quarter-finals, before defeating Jordan Devlin to advance to the semi-finals. Bate then defeated Wolfgang in the semi-finals and Pete Dunne in the final to win the tournament and become the inaugural champion. Bate was presented with the title belt by Triple H, William Regal, Finn Bálor and Fit Finlay. At 19 years old, he became the second teenager in WWE history to win a title, and the second (at the time, presently third) youngest champion of all time, after René Duprée. Bate signed a contract with WWE, which allowed him to continue taking independent bookings with some restrictions. 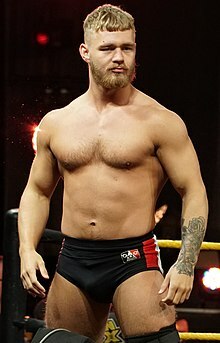 On the 1 February episode of NXT, Tyler Bate made his NXT debut defeating Oney Lorcan. On the February 15 edition of NXT, Tyler Bate successfully defended his title against fellow UK Tournament and tag team partner Trent Seven in the main event, with the two of them showing sportsmanship in the end. On April 4, Bate and others who participated in the United Kingdom Championship Tournament appeared on 205 Live. On the April 26 episode of NXT, Bate successfully defended his championship against Jack Gallagher, a member of the Raw roster. At NXT TakeOver: Chicago, Bate would lose his championship to Pete Dunne. On 7 November 2017, Bate would make his 205 Live debut, where he was defeated by Cruiserweight Champion Enzo Amore. On the 30 January 2018 episode of 205 Live, Bate would compete in the WWE Cruiserweight Championship tournament, where he was defeated by TJP in the first round. On 15 May 2018, Bate defeated TJP, Kalisto and Kenny Williams in a fatal four-way match. On the December 20 episode of NXT, Bate received his rematch for the WWE United Kingdom Championship, but again lost to Dunne. During day one of the second annual United Kingdom Championship Tournament on June 18, Bate, Dunne and Seven (known in Europe as British Strong Style) defeated The Undisputed Era (Adam Cole, Kyle O'Reilly and Roderick Strong) in a six-man tag team match. The next day, Bate and Seven defeated O'Reilly and Strong to capture the NXT Tag Team Championship, but lost the titles back to O'Reilly and Strong on the 11 July episode of NXT in a critically acclaimed match which drew five stars from Dave Meltzer. Bate is renowned for his strength and power moves, often performing multiple delayed deadlift suplexs including Bridging belly-to-back, Bridging German and Exploder variations. He has also been known to utilise an Airplane spin and Giant swing - occasionally on multiple opponents at the same time. His finishing maneuver is a Sitout double underhook powerbomb called the Tyler Driver '97. Bate is a vegan and a good friend of fellow wrestler David Starr. Bate made his video game debut as a playable character in WWE 2K19. ^ "Tyler Bate". cagematch.net. Retrieved March 1, 2018. ^ a b c d e "The World's Largest Wrestling Database". Wrestlingdata.com. Retrieved February 5, 2017. ^ Soucek, Andrew. "SOUCEK'S WWE UK CHAMPIONSHIP TOURNAMENT REPORT 1/15: Ongoing coverage of night two of UK Championship tournament". Pro Wrestling Torch. Retrieved January 15, 2017. ^ Bean, Martin. "Tyler Bate". ^ "CHIKARA For British Eyes Only at Wulfrun Hall wrestling results". ^ "CHIKARA Let 'em Eat Cake at Wulfrun Hall wrestling results". ^ "CHIKARA Afternoon Delight at The Garage wrestling results". ^ "CHIKARA King of Trios '15 - Night 3 at Palmer Community Center wrestling results". ^ "CHIKARA No One's First, And You're Next at The Wrestle Factory wrestling results". ^ Green, Dave (September 2, 2017). "9/1 Chikara "King of Trios 2017: Night One" in Wolverhampton, England: House of Throwbacks vs. House Attack, House Strong Styles vs. House Whitewolf". Pro Wrestling Torch. Retrieved September 2, 2017. ^ Green, Dave (September 3, 2017). "9/1 Chikara "King of Trios 2017: Night Two" in Wolverhampton, England: House Throwbacks vs. House Strong Style, Quackenbush, Pete Dunn, Tyler Bate, Trent Seven". Pro Wrestling Torch. Retrieved September 3, 2017. ^ Green, Dave (September 5, 2017). "9/3 Chikara "King of Trios 2017: Night Three" in Wolverhampton, England: King of Trios finals with House Sendai vs. House Strong Styles". Pro Wrestling Torch. Retrieved September 5, 2017. ^ "PROGRESS Chapter 28: Please, Please, Please, Let Me Get What I Want at The Ritz wrestling results". ^ "PROGRESS Chapter 33: Malice In Wonderland at Electric Ballroom wrestling results". ^ "PROGRESS Chapter 39: The Graps of Wrath at Electric Ballroom wrestling results". ^ "PROGRESS Chapter 41: Unboxing Live! at Electric Ballroom wrestling results". ^ "Progress Chapter 55 results: Pete Dunne vs. Travis Banks". Wrestling Observer Newsletter. 11 September 2017. Retrieved 11 September 2017. ^ "Photos from the historic U.K. press conference". ^ Soucek, Andrew. "SOUCEK'S WWE UK CHAMPIONSHIP TOURNAMENT REPORT 1/14: Ongoing coverage of night one of UK Championship tournament". Pro Wrestling Torch. Retrieved 14 January 2017. ^ "WWE UK Championship: 19-year-old Tyler Bate beats Pete Dunne to become first-ever WWE UK Champion at Blackpool extravaganza". The Sun. 2017-01-16. Retrieved 2017-01-17. ^ Currier, Joseph (2017-01-20). "WWE pulls more UK talent from appearances". Wrestling Observer Newsletter. Retrieved 2017-09-22. ^ Currier, Joseph (2017-01-23). "Dunne, Bate & Seven off of wXw show due to WWE commitments". Wrestling Observer Newsletter. Retrieved 2017-09-22. ^ "2/1 NXT TV Review". PWTorch.com. Retrieved 2017-02-05. ^ "British Strong Style def. Undisputed ERA in a Six-Man Tag Team Match". WWE. June 25, 2018. Retrieved June 26, 2018. ^ Erskine, James (June 19, 2018). "LIVE, ONGOING WWE UK CHAMPIONSHIP TOURNAMENT NIGHT TWO SPOILERS FROM LONDON". PWInsider. Archived from the original on June 20, 2018. Retrieved June 19, 2018. ^ "NXT TV TAPING REPORT 6/21 (Spoilers): Post-Takeover tapings including title contenders named, Ciampa, Gargano, Tag Titles contested". Pro Wrestling Torch. June 21, 2018. Retrieved February 26, 2019. ^ "NXT TAKEOVER: CHICAGO REPORT MAY 20, 2017". pwtorch.com. Retrieved 2018-08-25. ^ "NXT TAKEOVER REPORT 8/18: Ongoing coverage of event headlined with Cimpa vs. Gargano, Baszler vs. Sane Live from Brooklyn". pwtorch.com. Retrieved 2018-08-25. ^ Fannin, Pat (January 30, 2017). "David Starr On Defending German Championship, Matt Riddle, And Crying For Tyler Bate". FightFull.com. Retrieved June 28, 2017. ^ Cole, Caitlin (2018-12-19). "Complete WWE 2K19 Roster". Rumble Ramble. Retrieved 2019-04-16. ^ "Daily Update: Riddle & Cobb, BOLA night three, King of Trios winners". Wrestling Observer Newsletter. September 3, 2017. Retrieved September 4, 2017. ^ Kreikenbohm, Philip. "FCP Tag Team Championship « Titles Database « CAGEMATCH - The Internet Wrestling Database". www.cagematch.net. Retrieved 2018-06-08. ^ "Moustache Mountain IWS Tag Team Champs", International Wrestling Syndicate, Retrieved on October 07, 2018. ^ Noël, Mélanie. (2018-10-07) "BATE ET SEVEN CHAMPIONS AU QUÉBEC", Lutte Quebec, Retrieved on October 07, 2018. ^ "RevPro Undisputed British Tag Team Championship". Retrieved August 20, 2018. ^ "NXT Tag Team Championship". WWE. Retrieved February 26, 2019. ^ "WWE United Kingdom Championship". WWE. Retrieved January 15, 2017. ^ Pappolla, Ryan (January 15, 2017). "Tyler Bate def. Pete Dunne to become first WWE United Kingdom Champion". WWE. Retrieved February 26, 2019. ^ "Full Tournament Results From WrestleMania 34 Axxess Day 3 - WrestlingInc.com". WrestlingInc.com. Retrieved 2018-06-08.